✪ 2 block from 5th Avenue !!! 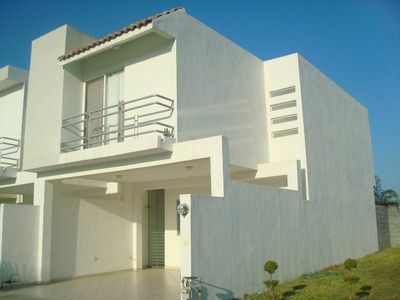 ✪ 5 minutes from the sea !!! This apartment has 2 bedrooms, each with its own bathroom (complete with shower), large closets, air conditioning, ceiling fans and Smart TV . 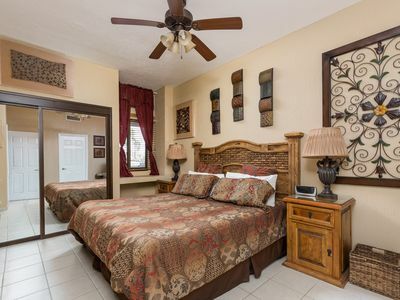 The master bedroom has a king-size bed and independent access to the terrace with jacuzzi. 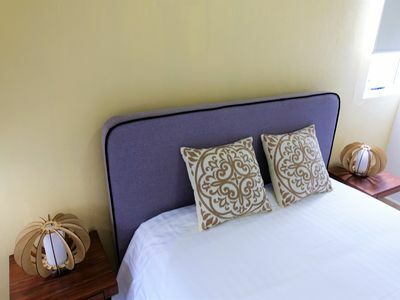 The second bedroom has 2 beds, one queen size and one single. Its large windows offer a wonderful natural lighting, especially the living area, which has a double sofa bed (up to 2 more people) and a 55 "Smart TV. 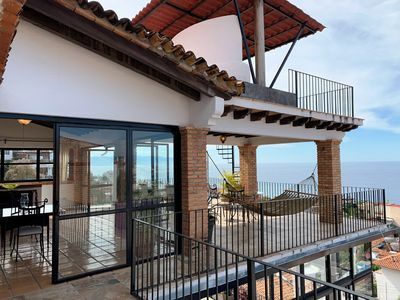 From the living room you have view of the terrace that has an outdoor Jacuzzi and partial views of the sea. 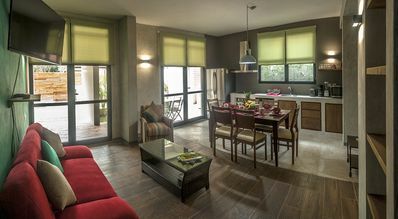 The apartment is decorated with taste and quality, as well as it is equipped with everything you will need for a comfortable stay. 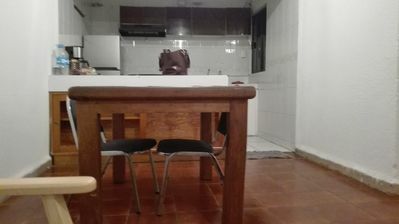 The kitchen is fully equipped with, toaster, blender, microwave, oven, refrigerator, coffee maker, ceramic hob, dishes, glasses, pots, pans, etc. 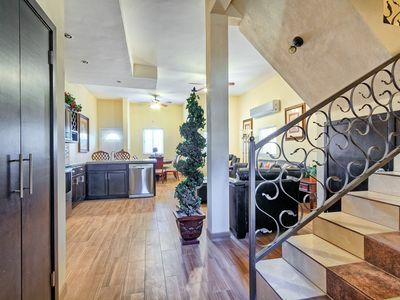 Condo has independent air conditioning in each area and high speed internet. The equipment of this unit is completed with washing and dryer machine, iron, electric water heater, safety box, clothes hangers, chairs and beach umbrella. IMPORTANT READ: The price of the rent includes: water, internet, security. Regarding electricity, 30 kwatts per day will be included for short-term rentals (1-27 days), the excess of that consumption must be paid in cash at the end of your stay (credit or debit cards are not accepted). 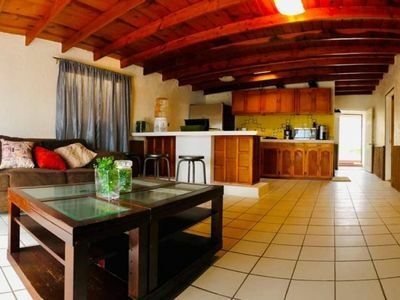 For long-term rentals (28 days or more), you will pay the total electricity consumption, we don’t include any kwatt (you must take into account that long-term rentals have a special price and lower than short-term rentals) . Payment of electricity will be made at the end of your stay in cash, we accept pesos, dollars or euros. We do not accept debit or credit cards. 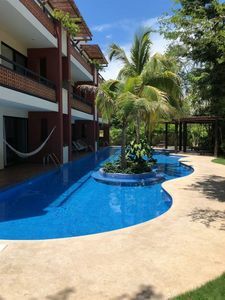 Condo has a large roof top, with pool and ocean views, solarium area with lounge chairs, tables with chairs and umbrellas, bar for preparing drinks and toilets. 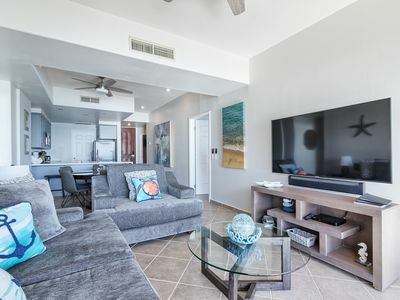 Condo is delivered perfectly clean and we provide our guests with bedding, hand towels, bath and pool towels, bathroom amenities, toilet paper, dish soap, kitchen towels, and some basic products for you to start your stay. In the lobby of the Condominiun you will have always staff that can support you with some things that you may need, such as asking for a specific address, answering questions about the building,calling taxis, etc. The staff here is part of the Condominium administration and they are always willing to help. The building has covered parking and there are no assigned places for each department, so if you bring a car, you can park in empty spaces that are not marked for administration use. We do not guarantee space in the parking lot, since the empty spaces will depend on the occupation of the building. 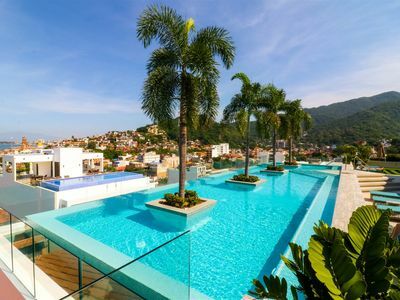 In the roof top you will find a gym with basic equipment, as well as the pool, you must respect the rules and schedule of the building. ✪ Transportation. We have transportation service to and from the airport. Ask about our rates..
✪ Tours. Our tour specialist can give you all the information you need regarding the activities you can do in Riviera Maya. We can suggest both private and group activities. ✪ Extra cleaning. The apartment is delivered clean and your departure cleaning is already included in the rent, in case you require cleaning during your stay, you can request it by an extra cost. ✪ Laundry The apartment has a washing machine and dryer, but in case you need it, we can take care of your laundry where it is collected and delivered to your home. You will pay the cost of the laundry plus the service fee of 25 usd / 480 pesos. ✪ Shopping. In case you want to save time, we can make your shopping, just indicate the list of food you would like to have on arrival or during your stay and we will take charge of buying it and have it ready for you. You should pay the supermarket ticket plus a service fee of 25 Usd / 480 pesos. ✪ Chef. In case that you require a chef, it is necessary to let us know in advance as this service will depend of the chef availability . 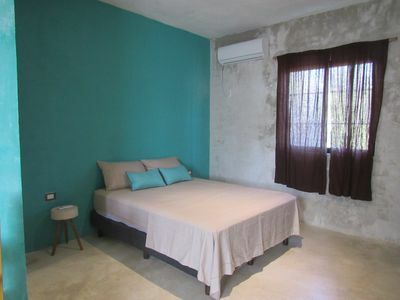 Our Condo is located in a very quiet and safe area at any time, and only 2 blocks from the famous 5th Avenue, where you can find all the "action" of Playa del Carmen, such as bars, restaurants, nightclubs, shopping centers, stores, etc; but far enough so that you can enjoy a genuine rest. From here you can walk to most of the places of interest of the 5th Avenue. 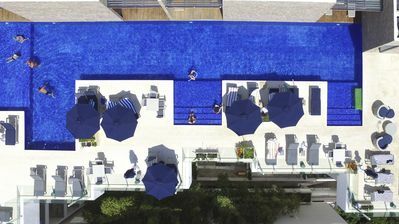 It is 2 minutes from one of the best and most famous beach clubs in the area, like Mamitas beach, very close to Shangri - La, in all of them there are beach clubs and bars where you can rent lounge chairs if you wish, or simply bring your towels to enjoy the sea and the sun. 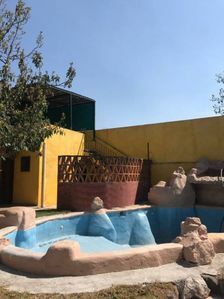 *Remember that we do not have a reception desk, and we will have to go to the property to open it for you, therefore it is very important that you keep us updated about the accurate time of your arrival flight delays, changes and so on (vía whatsaapp, msn, sms, etc); so we can be there and ready upon your arrival. 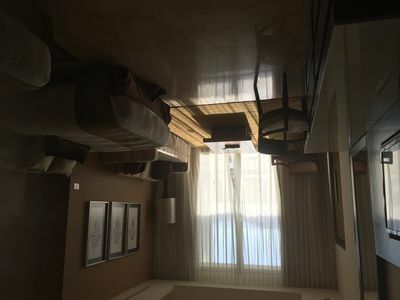 *We do not have luggage storage service and we do not have a safe room for that, so we can´t either receive your luggage before your check-in time or take care of it after your check-out. *No CREDIT OR DEBIT CARDS are accepted to pay electricity. 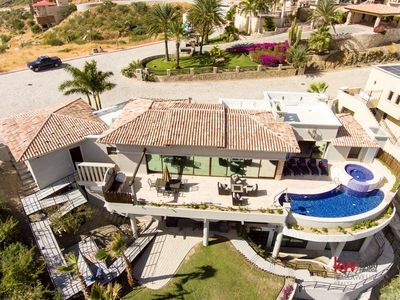 *You will not be able to enter the condo if you don´t pay (if applicable) at your arrival, amounts related to: security deposit, transportation, early check-in, late check out, and any other service required and agreed upon. NO EXCEPTION WILL BE MADE. Payments are only in cash, we don’t accept credit card. *Upon arrival we will show you the condo and we will review the inventory with you. Once we finish you will sign it, and we will leave a copy to you. In case something is missing and / or in bad condition; you must indicate it AT THAT moment; since once you signed the document, you are approving its content. 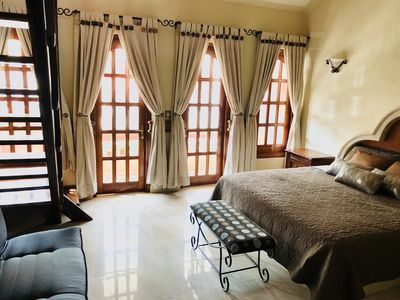 *You and your guests must respect the internal regulations and common areas, in case of non-compliance that generates fines of any kind, you will be notified immediately and yet to be e paid no later than the check-out day or day, or it could be deducted from the security deposit. *Be careful with linens and furniture upholstery, in case there are stains that can´t be removed with a normal laundry and/or cleaning, you must pay for a professional cleaning service. Please be careful with suntan lotions, creams, make-up, sit down with wet bathing suit, etc. *Turn off all air conditioners before leaving the property. Don´t program the Aircon at temperatures below 20º and keep doors and windows closed while they are running in order to save electricity and above all to avoid serious and costly Aircon problems. In case you notice Aircon is dripping water,which is one of the main signs of "overwork" because of the open doors and windows while working.Payments for Aircon breakdowns related to the misuse of them will be your responsibility. * we ask you NOT TO THROW PAPERS, SANITARY TOWELS, OR OTHER OBJECTS INSIDE THE TOILET that could block it, and the repair will be paid for you. *it is forbidden disconnect internet or the router in any case (there will be a fine of 100usd/1850 MX).If during your stay there is any inconvenience with water, electricity,internet or any other service hired on the condo, maintenance issues made by the condo administration, noise caused by works, concerts,etc; you must give immediate notice, with which we will contact the condo administration and/or the related public or private entities trying to do our best to help solve it or reduce it.It is important to know that these situations of force majeure ARE OUT OF OUR CONTROL and in most cases, we need to be patient until they are solved by those third parties. *It is forbidden to move any furniture or decoration, as well as disconnect electronic devices. Failure to comply with this, there will be a 100 usd/1850 MX fine. *Remember that the maximum departure time is at 11:00 a.m). WE ASKED PLEASE TO BE ON TIME, since late departures will be penalized with 50usd/925pesos WITHOUT EXCEPTION. 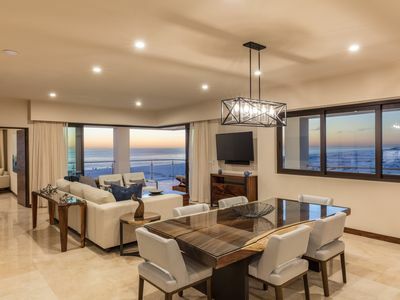 *Once you leave the condo, our cleaning and operation team will review it within the following 72hrs, in order to see if it has been left in the same condition in which we delivered it. In case we find damages of any kind, we will notify you immediately, so you can make the corresponding payment or will be deducted it from the security deposit. *In the case of reservations in which you must deliver in cash the security deposit upon your arrival, it will be returned within a period of 4 working days after your departure; as long as there are no damages or fines that must be charged, which will be discounted; as well as any service requested and not paid upon departure. *In case of reservations made through web pages where they retain a security deposit for damages or have your credit card, we reserve the right to choose if the payment related to damages or fines will be made directly with you or we use the page to do it. Paramar 01 _ Tropical Paradise, Private Garden & Jacuzzi, Tulum. Entire House Private Community Excellent Location! New Luxury Professionally Decorated Condo. 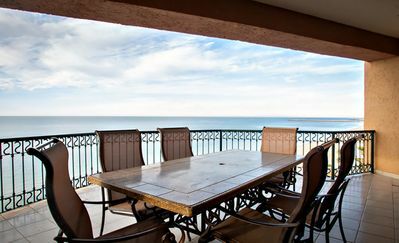 Deluxe Oceanview Condo w/ Resort Amenities, 3 Golf Courses & Resort Shuttles!